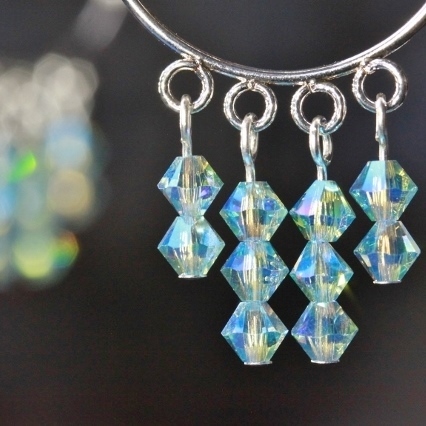 These pretty, dangly earrings are made from Swarovski crystals on silver plated hoop earring findings. The crystals are 4mm bicones in ABx2 coated aquamarine: both sides of the bicone have been covered with a thin metallic coating which gives the crystals a lovely iridescent shimmer. There are ten crystals on each earring so they will sparkle beautifully as the crystals move when you wear them. Each earring is 4.5cms (1.7ins) long from the bottom of the ear wire to the tip of the lowest bead. The largest hoop is 2.5cms (1in) in diameter and the smaller is 1.4cms (0.5in). The two hoops are fused together so do not move independently of each other.